Furnished second floor apartment located on the corners of Station Road and Oriel Road. This property is central to Antrim Town Centre, Bus and Train Stations as well as local schools and churches. Property comprises communal entrance hall, Lounge, Kitchen, Bathroom, and two bedrooms. Heating is by means of gas boiler. Viewing by appointment only via Mayfair and Morgan Estate Agents. Intercom system. Fitted carpet. Ornate Iron Balustrade. Hardwood door. Laminate floor. Single panel radiator. Intercom system. Two storage cupboards, gas boiler. Two UPVC double glazed windows with blinds. Laminate floor. Two seater settee with matching cushions. Occassional table and tv stand. Dining table with two chairs. UPVC double glazed window with blind. Ceramic grey tiled floor. Double panel radiator. Range of high and low level units with laminate work surface. Multicoloured wall tiling. BEKO brand new fitted oven and hob. BEKO brand new fridge. Zanussi brand new washing machine. Extractor fan in chrome finish.Stainless steele one and half bowl sink with mixer tap. Full complement of cutlery, utensils and crockery. UPVC double glazed window with blind. White suite comprising toilet, sink and pedestal and shower unit with folding enclosure door. Ceramic tiled floor. Part tiled walls. Single panel radiator. UPVC double glazed window with blind. Laminate floor. Single panel radiator. Timber frame double bed with mattress. Double beech effect wardrobe. Bedside locker. UPVC double glazed window with blind. Single panel radiator. Single timber bed frame and matress. Timber frame wardrobe. Laminate floor. 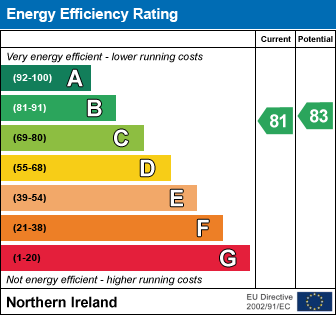 I am interested in 43 E Station Road, Antrim. Please contact me about this property.